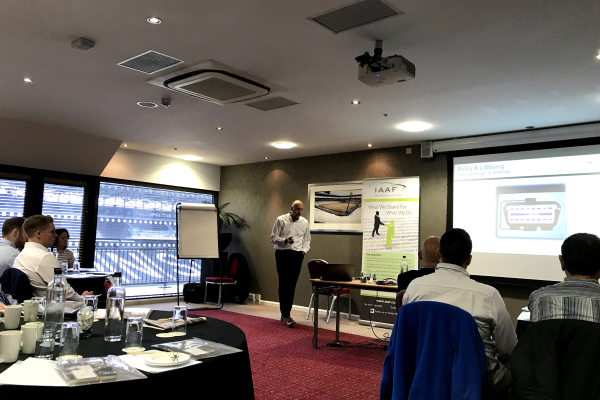 The Independent Automotive Aftermarket Federation (IAAF) held its first Industry Briefing of 2019 at Stadium MK, home of EFL League Two side MK Dons, in Milton Keynes on Thursday 21 March. Sponsored by industry recruitment specialists Autotech Recruit, the sold-out event in the venue’s Performance Suite welcomed seasoned speaker Quentin Le Hetet from GiPA and Virtual Academy’s Ben Stockton, both addressing technology’s fast-growing role in the aftermarket, now and in the future. The session was kick-started by IAAF Head of Membership Development Mike Smallbone, who updated members on all the latest industry developments including the Your Car, Your Choice campaign and its new pilot project in Chesterfield, as well as a policy and lobbying update on key areas including Type Approval legislation, the Extended Vehicle concept and the Block Exemption Regulations review. There was also a reminder of this year’s IAAF Golf Day events in conjunction with automotive industry charity BEN, to be held this summer. Ben Stockton from new IAAF member Our Virtual Academy then took the speaker’s slot, addressing attendees on upskilling vehicle technicians using video technology to enhance their knowledge and expertise. During his presentation, he showcased the advancement in training that was now available at the click of a button, with virtual reality enabling ‘1-2-1’ professional training with technicians. This was followed by GiPA’s Quentin Le Hetet who gave the audience a glimpse of the future thanks to aftersales market intelligence, with a discussion on what the next 5 years held for the independent aftermarket. In it, he covered mobility development, the VMs’ strategy, tapping into the potential brought by new marketplaces and the changing dynamics for diesel cars. The session then finished at 1.00 pm with lunch, where delegates had the opportunity to network with fellow members. The next meeting will be hosted by Involution, in its new company premises in Leeds on Thursday 20 June. As limited spaces are available, IAAF is advising members to book early to avoid disappointment by emailing Ann Silvester at anns@iaaf.co.uk.